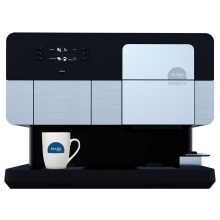 Flavia Coffee is the only no mess single cup coffee system! LOWEST PRICES on Flavia coffee & tea refills along with fast shipping and great service. We have the full selection of Flavia gourmet beverages. Get a full mix of available flavors in - mostly coffees & a few teas for the Flavia brewers. Includes 50 assorted Flavia filterpacks. This sample pack is Not included in volume discounts. Alterra Donut Shop Dark blend is roasted to uncover apricot flavors with undertones of caramel and a rich, chocolatey finish. Try ALTERRA COFFEE ROASTERS new Donut Shop Blend coffee! Grab a cup of this delightful coffee and enjoy the balanced notes of caramel, berry and honey. A classic, reinterpreted! We carefully crafted this blend of lightly roasted beans to create a medium bodied, smooth cup. This coffee is easy-drinking and has proven time and time again in consumer tests that it is a people-pleaser. We created this recipe of dark roasted beans to yield a rich, smoky cup that any barista would be proud to serve! This coffee was inspired by the award-winning baristas that have been a tradition in Alterra's coffee shops. This big-bodied coffee is dark roasted and yields a rich, smoky cup of coffee. More than 30% of the coffee in our Barista's Blend originates from Rainforest Alliance Certified  farms. Ethiopia, the birthplace of coffee, produces some of the finest coffees in the world. Our offering comes from the Ethiopian highlands from the highly prized region of Yirgacheffe. Our 100% Yirgacheffe beans are medium roasted to give a distinctively bright, fruity flavor. You can taste the hard work that went into this blend of premium beans - a medium roast to give a full bodied, balanced flavor with a hint of chocolate and molasses. This coffee is named after one of ALTERRA's coffee shops in Milwaukee. The cafeé, and this coffee, pay homage to the hard-working manufacturing tradition of the Midwest. More than 30% of the coffee in our Foundry Blend originates from Rainforest Alliance Certified™ farms. Bold and hearty, French Roast is a classic favorite among dark roast lovers. Our fresh take on this classic dark roast is a cup that's heavy bodied, with a smoky twist and a lingering finish. More than 30% of the coffee in our French Roast originates from Rainforest Alliance Certified  farms. Relax and unwind with a blend of medium roasted beans and the creamy flavor of vanilla. More than 30% of the coffee in our French Vanilla originates from Rainforest Alliance Certified™ farms. Enjoy a luxurious blend of medium roasted beans and the continental flavor of hazelnuts. More than 30% of the coffee in our Hazelnut originates from Rainforest Alliance Certified  farms. This coffee was expressly crafted to act as a base for our specialty beverages. This luscious blend of dark roasted beans delivers a heavy bodied, bold and earthy flavored cup. Try it alone for an intense beverage or mix it with our cappuccino/latte swirl for an authentic coffee shop style beverage. More than 30% of the coffee in our Morning Roast originates from Rainforest Alliance Certified™ farms. Sumatran coffees are very popular with coffee enthusiasts. The woodsy and herbaceous flavor profile is extremely unique, making this a coffee that stands out amongst its peers. Our 100% Sumatran beans are dark roasted to give a heavy bodied, complex cup with a bold finish. This medium-roast blend was crafted from three Latin American coffees for slow sipping and savoring. It a smooth and balanced cup of coffee with hints of toffee sweetness and a crisp, clean finish. Great coffee brings friends and neighbors together like nothing else. That's why we created this medium roast to pay tribute to the time-honored pastime of lingering in the café, casually sipping an expertly brewed cup over conversation. The three Latin American coffees in this carefully crafted blend were selected for their balance and brightness, and the roast fine-tuned to brew the perfect medium-bodied cup. We decided to name it after our third café, opened by Alfred Peet in 1980 on Domingo Avenue in Berkeley, in the shadow of the Claremont Hotel. For more than three decades, Peet's regulars have gathered here to enjoy hand-crafted drinks and the camaraderie they inspire. And that's something worth commemorating. All Rights Reserved. PEET'S is a registered trademark and the P Cup logo, PEET'S COFFEE, and CAFé DOMINGO are trademarks of Peet's Coffee & Tea. 18 freshpacks per rail. Order Quantity is based on rails. The majority of this blend is from Colombia, where luminosa means "shining or bright." This bright coffee is beautifully balanced by an Ethiopian coffee that adds just the right touch of delicately sweet aroma for a deliciously mild, smooth cup. We approached our first light roast, Colombia Luminosa, as we do all our coffees: carefully select the very best beans, then hand roast them in small batches to achieve their utmost flavor. In Colombia, luminosa means "shining or bright" and this bright blend layers subtle sweetness from Colombia with just the right touch of Ethiopia floral aromatics; a pair we knew would go perfectly together. We started with a coffee from the Huila region in Colombia's highlands, a place where beans are cultivated over 4,500 feet and known for their smooth, sweet character. Then to Ethiopia, coffee's birthplace, where unique varieties yield exquisite coffees with delicate aromas. Peet's darkest roast is intensely bold and flavorful with pronounced smoky overtones & a pleasant bite. Only top-quality Arabica coffee from the highest altitudes of prime Latin American growing regions is selected for this roast. The signature taste and rich coffee character of French Roast comes from a longer, hotter roast, which not all beans can handle. For our darkest roast, we select only top-quality Arabica coffee from the highest altitudes of prime Latin American growing regions. Beans mature slowly at these altitudes, becoming denser, harder and packed with flavor - perfect for retaining boldness and complexity under the intense heat of a deep roast. Peet's French Roast is not a coffee for the cautious, but for those who embrace the powerful taste, pronounced smoky overtones, and pleasant bite. This dark, deeply flavorful blend pairs well with cream and sugar, and inspires reactions like this one from John "Nic" Nicolini, a Peet's roaster for over 20 years: "On a normal day, I cup 50 coffees before 7 a.m. But I always come back to French. You inhale that smoky aroma, and then a subtle sweetness pops out that awakens your taste buds. It's visceral." STEEL HORSE Coffee, from the makers of ALTERRA , powers the positive productive momentum that makes for a smart, successful workday. Made from only real ingredients , coffee and cocoa flavanols, this better built cup of coffee gives a natural edge with no artificial additives. By keeping those in the office focused and alert, we help to empower the whole office to tackle a challenge-filled day full steam ahead. STARBUCKS Veranda Blend is mellow & soft. Subtle with delicate nuances of soft cocoa and lightly toasted nuts. STARBUCKS Pike Place is well-rounded with subtle notes of cocoa and toasted nuts balancing the smooth mouthfeel. STARBUCKS Cafe Verona is well-balanced and rich with a dark cocoa texture. Flavor notes of dark chocolate, raisin, and brown sugar. Dark Roast Espresso made from 100% Arabica beans. But if you've ever tried old packs even well over a year old, you can't tell the difference. And Flavia points out that these are "Best By" dates and not "Expiration Dates." Decaffeinated espresso made from 100% Arabica beans with flavor notes of cocoa, grain and brown sugar. 60% OFF These are packs with past Best Buy dates - they taste exactly the same but have dates of July 28, 2018. Indulge yourself with a perfect Latte or Cappuccino without leaving the office. DOVE carefully selects the finest ingredients and refines them to deliver the ultimate tantalizing experience. Now that same silky chocolate experience has been captured in the only hot chocolate made with real DOVE chocolate. The convenience and freshness of FLAVIA together with the indulgent chocolate taste of DOVE - a combination sure to be loved. FLAVIA® fresh leaf teas draw together the varied traditions of Europe and the Orient. Our TAZO Zen tea blend is the best way to pamper yourself and find your calm. Infused with green tea leaves, lemon verbena leaves, spearmint and lemongrass, it promotes wellness of body and mind. We are so proud of this blend for only having 45mg of caffiene and vibing with our taste buds so well! 20 freshpacks per rail. Oder Quantity is based on rails. This cup has a light body and a vegetative and nutty aroma and taste with balanced bite and sweetness. It displays a soft golden cup color. Our Select Green features one of the top ten most famous Chinese teas-a spring-harvested Mao Feng. During the spring, the buds are plucked just at the beginning of the gentle rains when the buds have just begun to swell and are still tender. This herbal infusion boasts a harmonious, yet intense berry aroma. The brew is juicy, tart and sweet with a clean raspberry flavor. Hibiscus flowers produced in Northern Africa provide the tart and powerful flavor. Chilean rosehips and lemon peel add citrus notes and depth of flavor while sarsparilla root and ginger root from India imparts creamy, sweet and slightly spicy flavors. This herbal infusion is fresh with a clean aroma and a medium body. Sourced from the Pacific Northwest of the USA, the bold peppermint leaves in this beverage make for a clean minty cup with a subtle chocolate note and a lingering, cool finish. This brew is particularly delightful iced on a hot summer day! Green tea has been popular in the Middle East and parts of Asia for centuries, but has just recently gained popularity in the West for its unique grassy flavor and renowned health benefits. This green tea, harvested in Northern China, balances its vegetative taste with the subtle floral notes of jasmine. Jasmine flowers are gently blended into the green tea to transfer the delicate floral aroma to the leaves. At the center of this blend are aromatic and brisk black teas from North Africa which provide a colory cup and bright flavor. Second Flush teas from the Assam river valley in North Eastern India provide a strong, malty flavor and balanced astringency. This tea is strong enough to stand up to milk and sugar, but flavorful enough to be enjoyed without. More than 30% of the tea in our English Breakfast originates from Rainforest Alliance Certified  farms. We started with the high quality blend of black teas that act as the base for our English Breakfast. Then we added teas hailing from two different regions of Sri Lanka to deliver a medium body and a complex flavor. Finally, we infused this tea with the oil of bergamot,a small, fragrant citrus fruit hailing from sunny southern Italy that gives this tea its distinctive and well-loved citrus/floral flavor. More than 30% of the tea in our Earl Grey originates from Rainforest Alliance Certified  farms. This is a bright black tea with pronounced spice notes. Ginger, cinnamon, black pepper and cardamom combine in this traditional Indian beverage to create a rich, strong and complex brew. This bright black tea, sourced from North East India, is designed to be sweetened and served as a latte. Combine it with our cappuccino/latte swirl for an authentic coffee shop style Chai Latte. More than 30% of the tea in our Chai Spice originates from Rainforest Alliance Certified  farms. White tea is derived from the same plant as black and green teas, the Camellia Sinensis plant, but the difference is that white teas are completely unoxidized, yielding the delicate, refined flavor for which white teas are known. Our white tea, a Bai Mu Dan style tea produced in South Eastern China, is no exception. It is smooth and light bodied, soft and creamy, and gently infused with a subtle orange flavor. The following flavors have been replaced with new recipes of the same name or discontinued. The old recipes are no longer manufactured by Flavia, all inventories are gone and will not be available again. Please try the new recipe by Alterra or Bright Tea - they are found above.